, a great geographer, mathematician, and astronomer of antiquity, was born at Pelusium, in Egypt, about the year 70, and flourished in the reigns of Adrian and Marcus Antoninus. 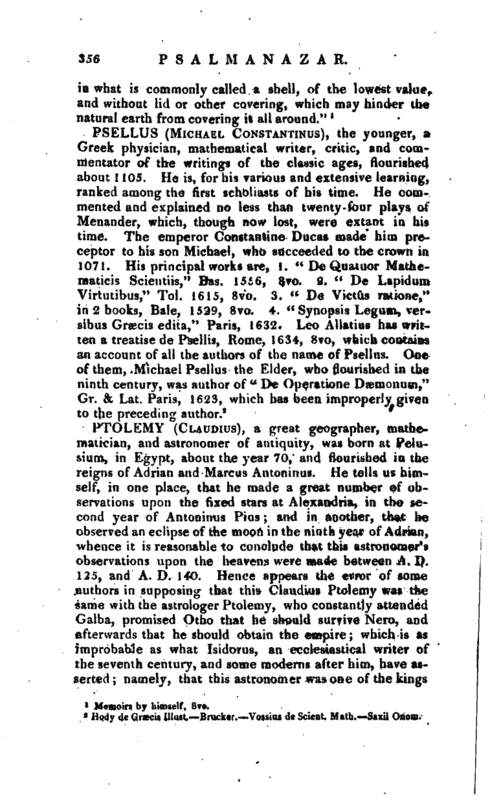 He tells us himself, in one place, that he made a great number of ob* servations upon the fixed stars at Alexandria, in the second year of Antoninus Pius and in another, that he observed an eclipse of the moon in the ninth year of Adrian, whence it is reasonable to conclude that this astronomer’s observations upon the heavens were made between A. D. 125, and A. D. 140. Hence appears the error of some authors in supposing that this Claudius Ptolemy was the same with the astrologer Ptolemy, who constantly attended Galba, promised Otho that he should survive Nero, and afterwards that he should obtain the empire; which is as improbable as what Isidorus, an ecclesiastical writer of the seventh century, and some modems after him, have asserted; namely, that this astronomer was one of the kings | of Egypt. We know no circumstances of the life of Ptolemy but it is noted in his Canon, that Antoninus Pius reigned three-and-twenty years, which shews that himself survived him. Science is greatly indebted to this astronomer, who has preserved and transmitted to us the observations and principal discoveries of the ancients, and at the same time augmented and enriched them with his own. He corrected Hipparchus’s catalogue of the fixed stars; and formed tables, by which the motions of the sun, moon, and planets, might be calculated and regulated. He was indeed the first who collected the scattered and detached observations of the ancients, and digested them into a system which he set forth in his “Μεγαλη συνταξις, sive Magna Constructio,” divided into thirteen books, and which has been called from him the Ptolemaic system, to distinguish it from those of Copernicus and Tycho Brahe. About the year 827, this work was translated by the Arabians into their language, in which it was called “Almagestum,” by the command of one of their kings and from Arabic into Latin, about 1230, under the encouragement of the emperor Frederic II. There were other versions from the Arabic into Latin and a manuscript of one, done by Girardus Cremonensis, who flourished about the middle of the fourteenth century, is said by Fabricius to be still extant, and in the library of All Souls college at Oxford. The Greek text began to be read in Europe in the fifteenth century and was first published by Simon Grynaeus, at Basil, 1538, in folio, with the eleven books of commentaries by Theon, who flourished at Alexandria in the reign of the elder Theodosius. In 1454, it was reprinted at Basil, with a Latin version by Georgius Trapezuntius and again at the same place in 1551, with the addition of other works of Ptolemy, to which are Latin versions by Camerarius. We learn from Kepler, that this last edition was used by Tycho. This principal work of the ancient astronomers is founded upon the hypothesis of the earth’s being at rest in the centre of the universe, and that the heavenly bodies, the stars and planets, all move around it in solid orbs, whose motions are all directed by one, which Ptolemy called the primum mobile, or first mover, of which he discourses at large. In the first book, Ptolemy shews, that the earth is in the centre of those orbs, and of the universe itself, as | he understood it: he represents the earth as of a spherical figure, and but as a point in comparison of the rest of the heavenly bodies: he treats concerning the several circles of the earth, and their distances from the equator; as also of the right and oblique ascension of the heavenly bodies in a right sphere. In the 2d book, he treats of the habitable parts of the earth; of the elevation of the pole in an oblique sphere, and the various angles which the several circles make with the horizon, according to the different latitude of places; also of the phenomena of the heavenly bodies depending on the same. In the 3d book, he treats of the quantity of the year, and of the unequal motion of the sun through the zodiac: he here gives the method of computing the mean motion of the sun, with tables of the same; and likewise treats of the inequality of days and nights. 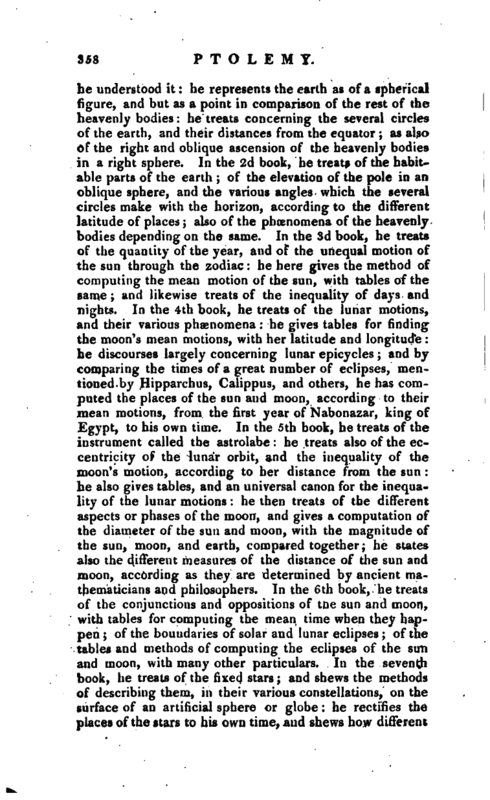 In the 4th book, he treats of the lunar motions, and their various phenomena: he gives tables for finding the moon’s mean motions, with her latitude and longitude: he discourses largely concerning lunar epicycles; and by comparing the times of a great number of eclipses, mentioned by Hipparchus, Calippus, and others, he has computed the places of the sun and moon, according to their mean motions, from the first year of Nabonazar, king of Egypt, to his own time. In the 5th book, he treats of the instrument called the astrolabe: he treats also of the eccentricity of the. lunar orbit, and the inequality of the moon’s motion, according to her distance from the sun: he also gives tables, and an universal canon for the inequality of the lunar motions: he then treats of the different aspects or phases of the moon, and gives a computation of the diameter of the sun and moon, with the magnitude of the sun, moon, and earth, compared together; he states also the different measures of the distance of the sun and moon, according as they are determined by ancient mathematicians and philosophers. In the 6th book, he treats of the conjunctions and oppositions of the sun and moon, with tables for computing the mean time when they happen; of the boundaries of solar and lunar eclipses; of the tables and methods of computing the eclipses of the sun and moon, with many other particulars. In the seventh book, he treats of the fixed stars; and shews the methods of describing them, in their various constellations, on the surface of an artificial sphere or globe: he rectifies the places of the stars to his own time, and shews how different | those places were then, from what they had been in the times of Timocharis, Hipparchus, Aristillus, Calippus, and others: he then lays down a catalogue of the stars in each of the northern constellations, with their latitude, longitude, and magnitudes. In the 8th book, he gives a like catalogue of the stars in the constellations of the southern hemisphere, and in the 12 signs or constellations of the zodiac. This is the first catalogue of the stars now extant, and forms the most valuable part of Ptolemy’s works. He then treats of the galaxy, or milky-way; also of the planetary aspects, with the rising and setting of the sun, moon, and stars. In the 9th book, he treats of the order of the sun, moon, and planets, with the periodical revolutions of the five planets; then he gives tables of the mean motions, beginning with the theory of Mercury, and shewing its various phenomena with respect to the earth. The 10th book begins with the theory of the planet Venus, treating of its greatest distance from the sun of its epicycle, eccentricity, and periodical motions it then treats of the same particulars in the planet Mars. The 11th book treats of the same circumstances in the theory of the planets Jupiter and Saturn. It also corrects all the planetary motions from observations made from the time of Nabonazar to his own. The 12th book treats of the retrogressive motion of the several planets; giving also tables of their stations, and of the greatest distances of Venus and Mercury from the sun. 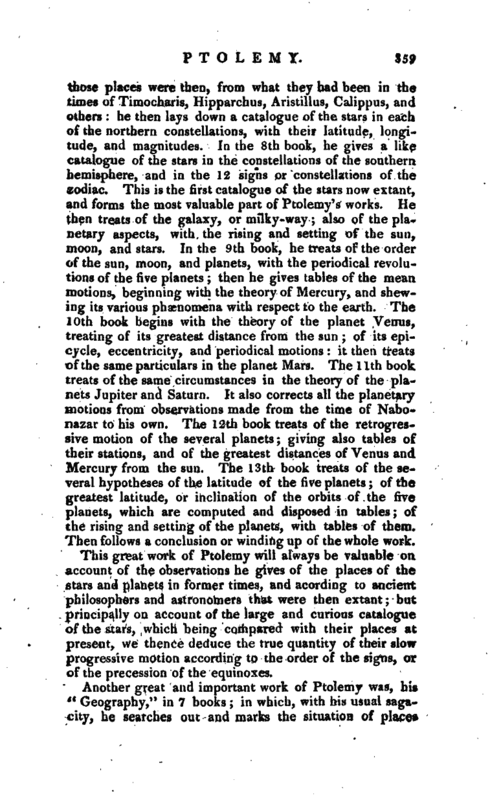 The 13th book treats of the several hypotheses of the latitude of the five planets; of the greatest latitude, or inclination of the orbits of the five planets, which are computed and disposed in tables; of the rising and setting of the planets, with tables of them. Then follows a conclusion or winding up of the whole work. This great work of Ptolemy will always be valuable oa account of the observations he gives of the places of the stars and planets in former times, and acording to ancient philosophers and astronomers that were then extant; but principally on account of the large and curious catalogue of the stars x which being compared with their places at present, we thence deduce the true quantity of their slow progressive motion according to the order of the signs, or of the precession of the equinoxes. Another great and important work of Ptolemy was, his te Geography," in 7 books; in which, with his usual sagacity, he searches out and marks the situation of places | according to their latitudes and longitudes and he was the first that did so. Though tliis work must needs fall far short of perfection, through the want of necessary observations, yet it is of considerable merit, and has been very useful to modern geographers. 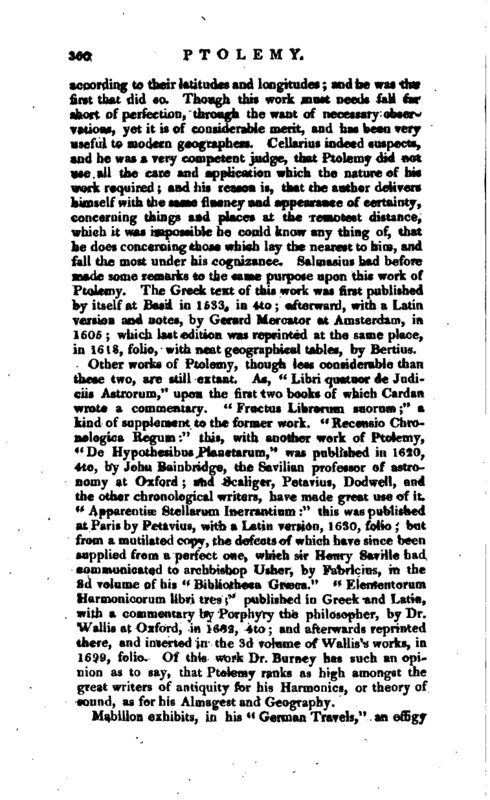 Cellarius indeed suspects, and he was a. very competent judge, that Ptolemy did not use all the care and application which the nature of his work required; and his reason is, that the author delivers himself with the same fluency and appearance of certainty, concerning things and places at the remotest distance, which it was impossible he could know any thing of, that he does concerning those which lay the nearest to him, and fall the most under his cognizance. Salmasius had before made some remarks to the same purpose upon this work of Ptolemy. The Greek text of this work was first published by itself at Basil in 1533, in 4to afterward, with a Latin version and notes, by Gerard Mercator at Amsterdam, in 1605 which last edition was reprinted at the same place, in 1618, folio, with neat geographical tables, by Bertius. Other works of Ptolenty, though less considerable than these two, are still extant. As, “Libri quatuor de Judiciis Astrorum,” upon the first two books of which Cardan wrote a commentary. “Fructus Librorum suorum” a kind of supplement to the former work. 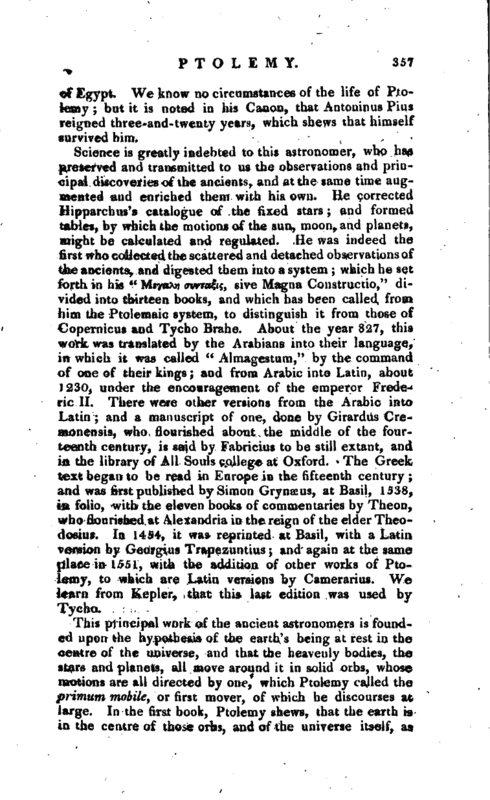 “Recensio Chronologica Regum” this, with another work of Ptolemy, “De Hypothesibus Planetarum,” was published in 1620, 4to, by John Bainbridge, the Savilian professor of astronomy at Oxford and Scaliger, Petavius, Dodwell, and the other chronological writers, have made great use of it. <e ApparenticE Stellarum Inerrantium“this was published at Paris by Petavius, with a Latin version, 1630, folio but from a mutilated copy, the defects of which have since been supplied from a perfect one, which sir Henry Saville had communicated to archbishop Usher, by Fabricius, in the 3d volume of his” Bibliotheca Grseca.“” Elementorum Harmonicorum libri tres" published in Greek and Latin, with a commentary by Porphyry the philosopher, by Dr. Wallis at Oxforcl, in 1682, 4to and afterwards reprinted there, and inserted in the 3d volume of Wallis’s works, in 1699, folio. 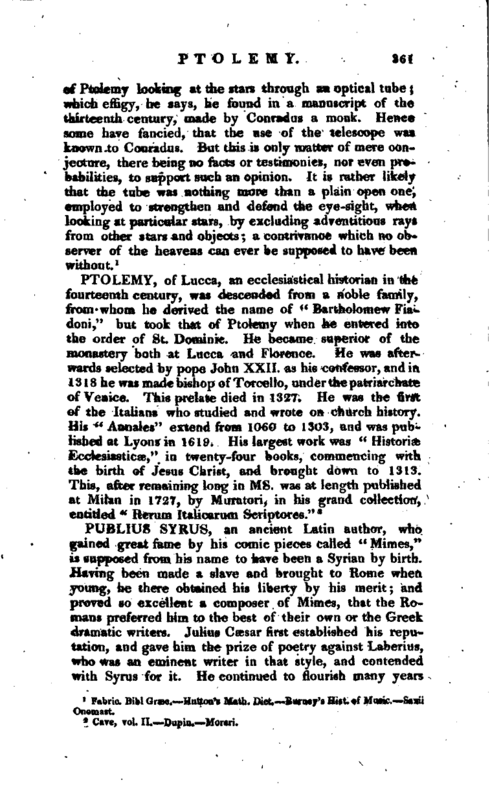 Of this work Dr. Burney has such an opinion as to say, that Ptolemy ranks as high amongst the great writers of antiquity for his Harmonics, or theory of sound, as for his Almagest and Geography. Fabric. Bibl Grtec. —Hutton’s Math. Dict. Barney’s Hist, of Music. Saxii Onomnst.